MLK Voice 4 Youth Contest Winners. On Sunday, January 20, 2 PM at the baby grand in Wilmington, seven courageous finalists, selected at the semifinals held on January 11-12, 2019 in Dover and Wilmington respectively, shared their powerful and passionate messages for social change through nonviolence. For the first time all seven finalists were female; as one person commented, they were a reflection of the times. The finalists spoke their truth, provided new insights to social issues, and inspired the audience to take action. Deborah Olatunji, a junior from the Charter School of Wilmington, took home the $2,000 first prize sponsored by the Quintin E. Primo Fund for Racial Justice presented by Dr. Sheridan Quarless Kingsberry. Second Prize of $1,000 sponsored by Alpha Phi Alpha Fraternity, Inc. and Gamma Theta Lambda Education Foundation was presented by both Michael Yancey and Kevin McAllister to Neha Das, a sophomore, & Sana Nangia, a junior, from the Charter School of Wilmington. Neha and Sana were the first duo to compete in the finals. The $500 third prize sponsored by the Rotary Club of Wilmington and presented by Kai Lassen, Past President, went to Dha’zhea Freeman, a senior at Howard School of Technology. In addition finalists were presented a $50 gift card on behalf of Matt Meyer, New Castle County Executive. 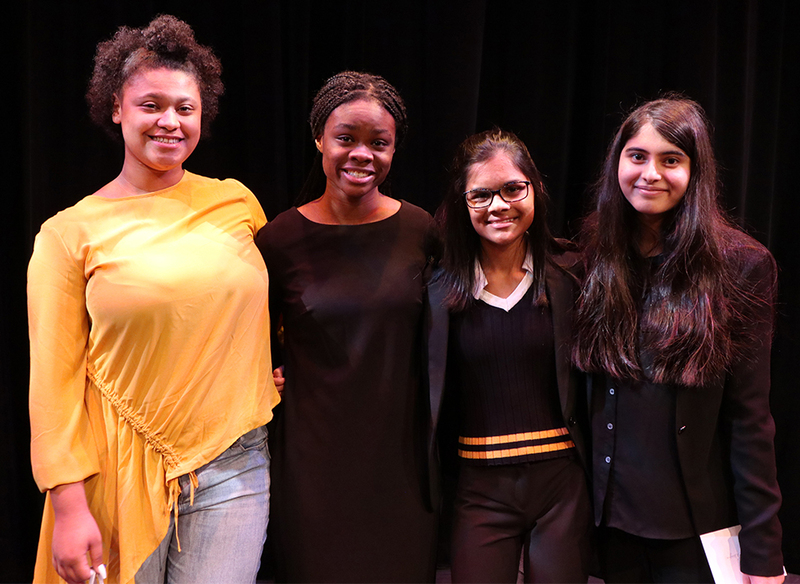 Other finalists were: Aniya Brown, Caravel Academy (Grade 12); Trinity Dockery-Stone, Milford High School (Grade 9); Nyani Scott, Dover High School (Grade 10); and Anya Verucci, Newark Charter High School (Grade 12). Margie Rivera, Founding Member, ASPIRA of Delaware, Inc.
Past winners of MLK VOICE 4 YOUTH, Kaamilah Diabaté, 2016 MLK winner, graduate of Howard High School of Technology, now a freshman at American University and Tyrek Traylor, 2017 MLK winner, graduate of Conrad Schools of Science, now a sophomore at Delaware State University, served as Masters of Ceremonies for the event. In addition to the finalists speaking, the very talented JazzChords of Calloway, students from Cab Calloway School of the Arts, led by their teacher, Martin Lassman, performed during intermission. Following the event, contestants, judges, friends, and family members were invited to a reception hosted by Alpha Kappa Alpha Sorority, Inc. Zeta Omega Chapter held, in the lobby of the baby grand. 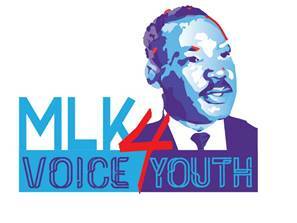 Since the first contest in 2016, MLK VOICE 4 YOUTH, presented by Christ Church Christiana Hundred and the YWCA Delaware, challenges Delaware high school students, grades 9 through 12, to reflect on Dr. King’s work for social change through nonviolence and share how it speaks to their hopes and dreams today. Students are asked to contemplate if Dr. King was alive today, what would he say about justice, Twitter, drugs, and violence? Would he consider today’s protests and marches different from those in the 1960’s or the same? Unlike traditional speaking contests, contestants have creative freedom to use poetry, speech, and/or rap and may present individually or as a team to convey their message. The message they share is the priority. To help students prepare for the contest, workshops were offered at no charge in Dover by Dr. Donna Blakey, Delaware State University, and Lester Fair, 2018 2nd Place MLK winner, and in Wilmington by Kemuel Harding, 2018 MLK winner, David Kozinski, 2018 Delaware Division of the Arts Poetry Fellow, Jayne Thompson, Widener University, and Delaware’s First Lady, Tracey Quillen Carny. Hugh Atkins, Past Chair of English at Tower Hill, also provided one-on-one coaching sessions to several finalists as did Donna Blakey. The MLK finals are free and open to the public. For those who could not be in Wilmington at the live contest, the MLK finals were streamed to remote viewing sites at Delaware State University, Dover, Delaware (Kent County) and to First State Community Action Agency, Georgetown, Delaware (Sussex County). Alpha Phi Alpha Fraternity, Inc. & Gamma Theta Lambda Education Foundation, Inc. The Grand Opera House, Inc. Thanks to the all the contestants for sharing and to the numerous volunteers, judges, and sponsors of MLK VOICE 4 YOUTH whose help and support created a wonderful tribute to Dr. Martin Luther King Jr.